In another large bowl whisk together the flour, sugar, baking powder, and salt. Stir in the chocolate chips. With a rubber spatula fold the wet ingredients, along with the melted butter, into the dry ingredients and stir only until the ingredients are combined. Do not over mix the batter or tough muffins will result. Evenly fill the muffin cups with the batter, using two spoons or an ice cream scoop. In a small bowl combine the topping ingredients and then sprinkle a little topping on each muffin. Place in the oven and bake until a toothpick inserted in the center of a muffin comes out clean, about 18 - 20 minutes. Transfer to a wire rack and let cool for about 5 minutes before removing from pan. 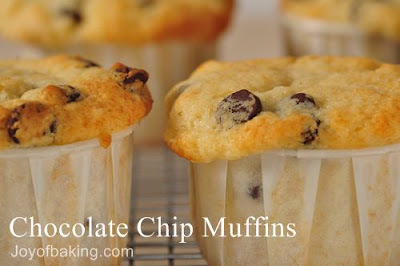 I've never had a chocolate chip muffin but I would definitely like to try one...Have a great weekend! Wow Those look Yummy! And I like the liners they used in the picture. thanks, I'll be baking these soon. Mmmmm they look yummy! They wouldn't last long in my house! Sounds like a great snack to me!! Have one for me! Ohhhhh! My mom used to make those when I was little. I think maybe I will have to make some with Lillie this weekend - they look so good! Those look yummy! Another good recipe. Thanks for posting such delicious recipes for us to try. I made your pumpking muffins last night.....yummy! I had one before bed but I really wanted three. Ohhhhhh....chocolate! I'm trying to be good, but these are so tempting. They look delicious, Melanie! This looks so delicious. I am going to bake these today. Thanks for including the metric conversions!